For wrists, ankles & boots, 39" black leather band is supple & stylish in brass or steel designs. Made in a silver and pewter mix, with substantial size to the links. This creates a bold, eye-catching piece of jewelry. 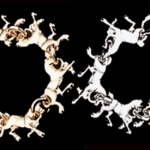 Exselle Running Horse Bracelet beautifully detailed horses running around your wrist. Stylish Beaded charm bracelet with silver horse heads, horseshoes, beads in aqua, blue, pink or purple. Horse Head Mood Bracelet changes with body temperature, with silver trim and chain. Stylish quality silver chain bracelet with horse head charm, beautiful accent to any horse lover's attire. Simply elegant silver horseshoe charm bracelet with rhinestone, perfect accent to any horse lover's attire. Fun kid's horse bracelet, push the button and an LED light starts blinking, for young horse lovers everywhere. Beautiful Paua Shell Galloping Horse Bracelet, each multi-colored shell a unique style. Fun Paua Shell Galloping Pony bracelet, each shell is unique, look for matching necklace and ring. Stylish beaded rearing horse oval pendant bracelet, look for matching necklace, to complete the set. Stylish beaded white horse charm bracelet, in pink or purple, look for matching necklace, to complete the set. 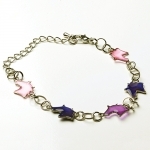 Pretty Horse Heads Mood Bracelet, watch the horse heads change color with your different 'moods'. Beautiful, stylish bracelet in black with silver buckle and crystals, perfect for all ages. Beautiful, stylish black leather bracelet with silver buckle and matching 'heart shaped' design. Beautifully crafted two tone padded superior leather bracelet with bit. Turquoise stones highlight antique stainless steel, 1200 gauss samarium cobalt magnet in each link. Attractive bracelet that fits your lifestyle, 1200 gauss Samarium Cobalt magnet is in each connector link. Polished stainless steel & 18K gold plating accents, 1200 gauss magnet is in each connector link. Beautiful emerald cut cubic zirconia gems, polished stainless steel, and 18K gold plating 3 microns thick. Stylish cable bracelet, polished connectors & ribbed tips, 1200 gauss samarium cobalt magnet. This design is elegance and class, there is a 1200 gauss magnet in each large link. Stylish leather padded bracelet brings a new dimension to your jewelry, lots of pretty colors. Adorable faux leather buckle on bracelet with silver tone charms shows off your horse loving style.